Five climate zones in one sauna. Every human being is special, and everyone deserves moments of pure relaxation. Create your own personal oasis of wellbeing – with the patented SANARIUM and SaunaPURE® by KLAFS. 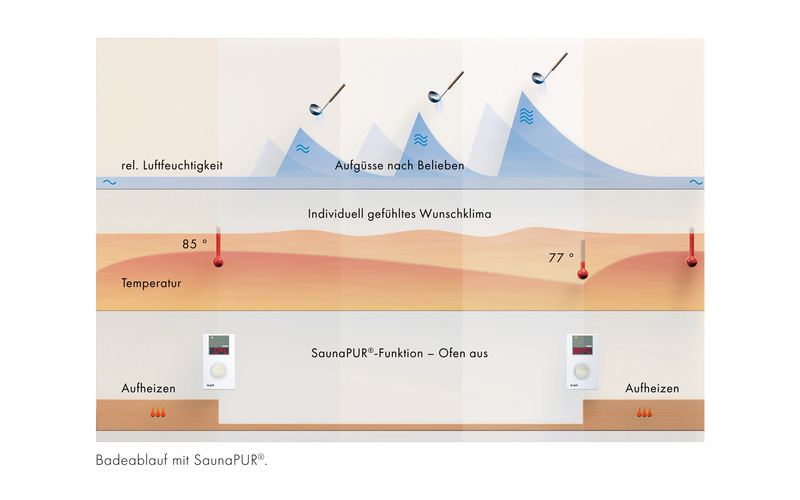 Choose whichever “climate” takes your fancy, and the SANARIUM with SaunaPURE®will automatically adjust the humidity and temperature to the setting of your choice. 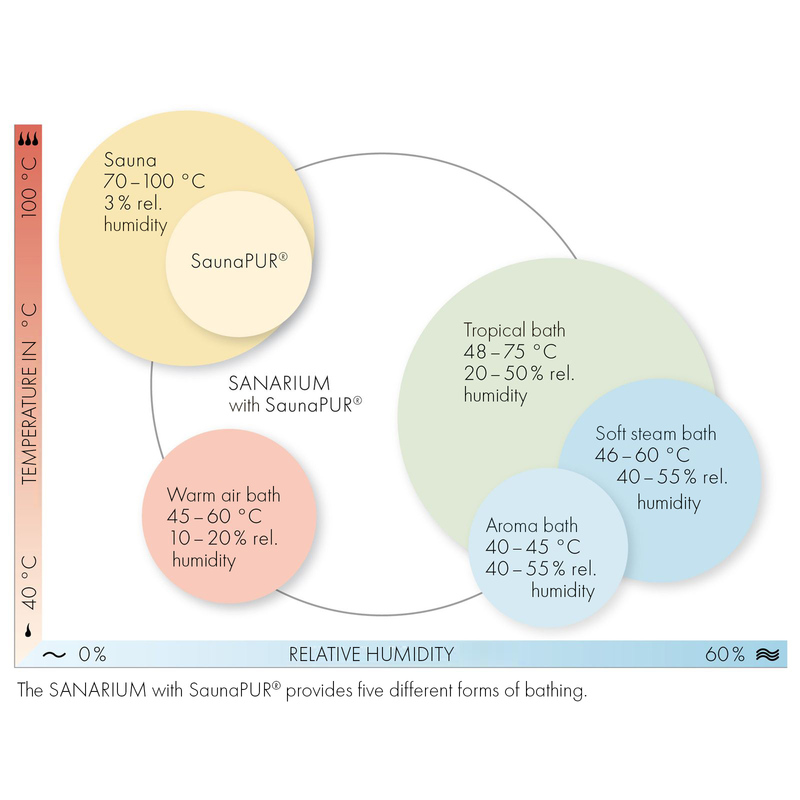 Together, SaunaPURE® and SANARIUM turn one sauna into five: a classic sauna, a warm air bath, a tropical bath, an aroma bath or a SOFT STEAM BATH. 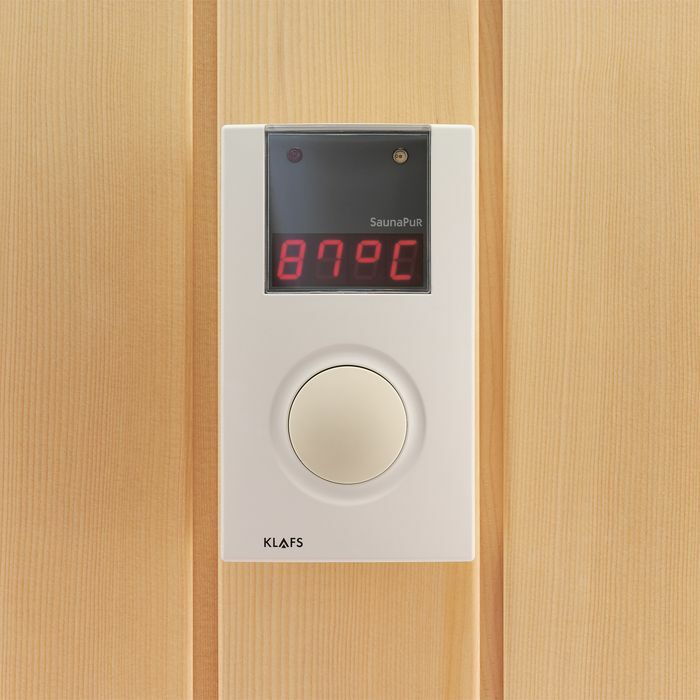 Virtually all KLAFS sauna heaters can benefit from the advantages offered by the SANARIUM® system, which was developed exclusively by KLAFS. 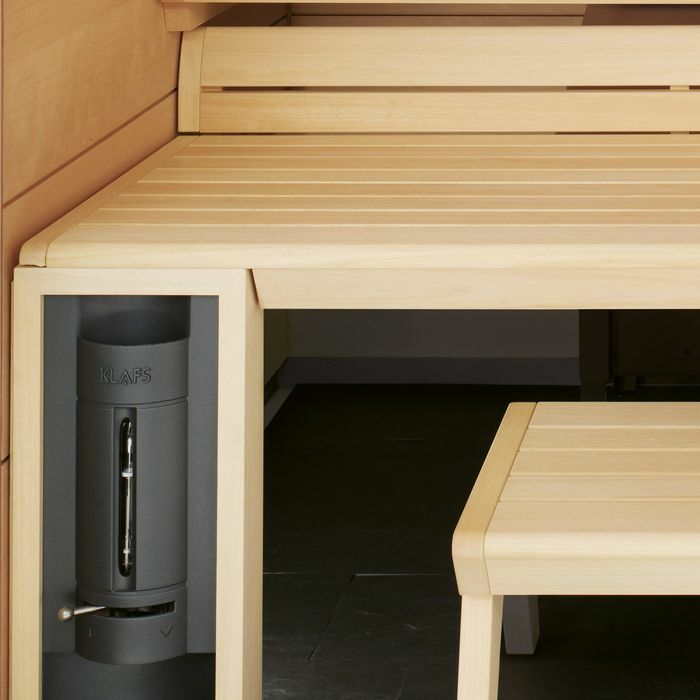 At first glance, the SANARIUM with SaunaPURE® looks no different to a "conventional" sauna – yet it offers an exceptional spa experience. 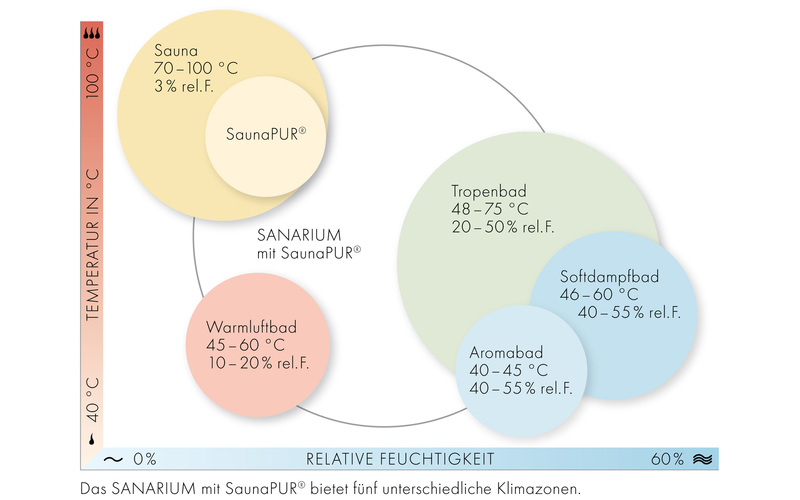 The SANARIUM with SaunaPURE® offers five different climate zones. By increasing the humidity, the"perceived" temperature in the SANARIUM® remains constant even when the thermometer drops. This humidity can also be created through fragrant steam. An aroma bowl scents the air inside the sauna. 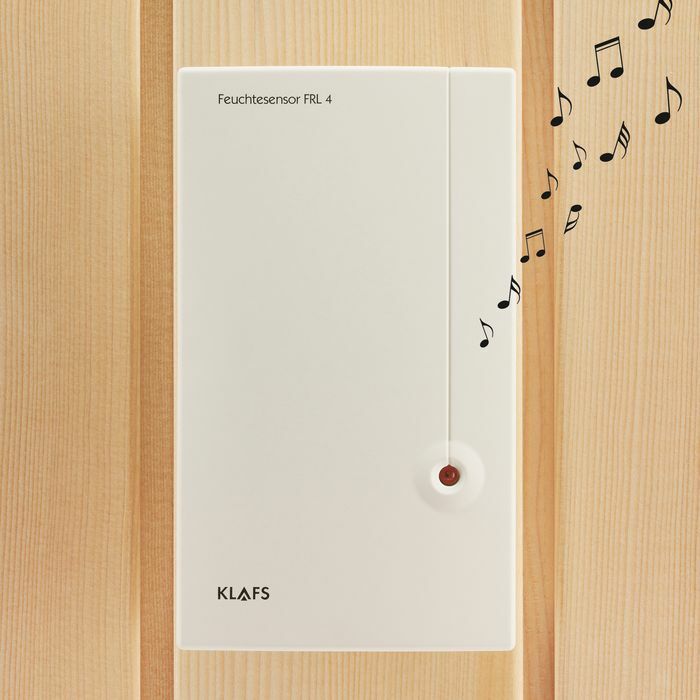 And if you’re feeling in the mood, a loudspeaker integrated in the humidity sensor can fill the sauna with the music of your choice. The SaunaPURE® function also offers the most basic of all relaxation experiences in traditional Finnish style. For all those who want to get back to the roots of sauna bathing, it’s the perfect choice. The sauna heater switches off as soon as the sauna has reached 80°-85°C. It then radiates gentle warmth, with the potential for lavish steam. “Löyly”, as the Finnish would say. We say – thank KLAFS for the SaunaPURE® button! Evidence shows that relaxing in a SANARIUM® is more than just soothing and pleasant – it’s also verifiably good for your health. 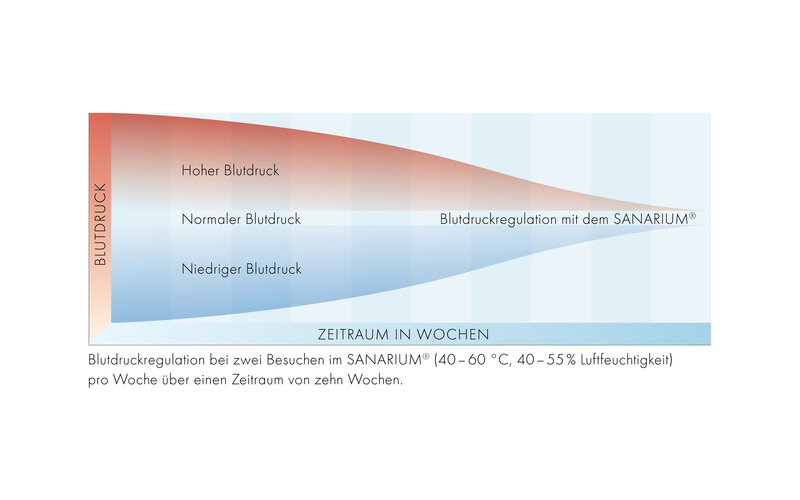 A study conducted by the world-famous Charité in Berlin has shown that the gentle warmth and climate in the SANARIUM® can lower blood pressure and relieve circulatory disorders. And that’s not all. Using a SANARIUM® on a regular basis “exercises” your cardiovascular system and makes you much less susceptible to catching cold. Overall, the SANARIUM® was shown to have a positive impact on the immune system. Our largest organ – skin – is also grateful for this very special beauty treatment. Not only it is cleansed and purified, but it’s also supplied with all the nutrients and minerals it needs. 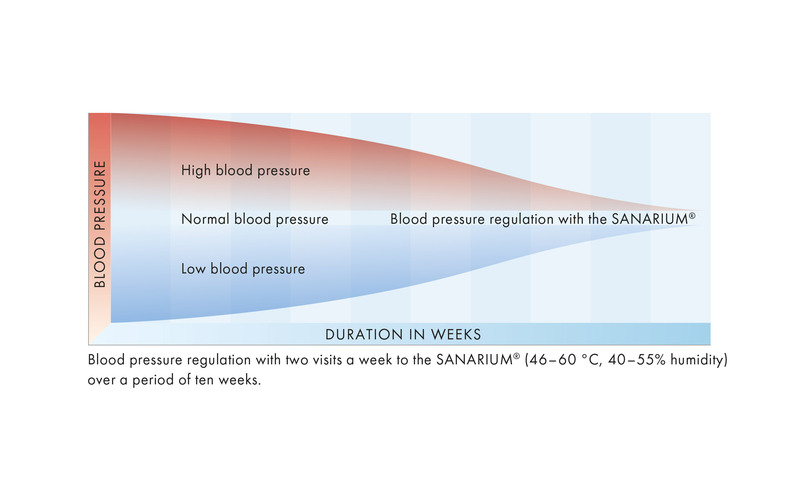 Blood pressure regulation after using the SANARIUM® twice a week (40-60°C, 40-55% humidity) over a period of ten weeks. Using the SANARIUM® regularly can even lower your blood pressure. Using a low-temperature sauna twice a week (temperature: 55°C, humidity: 48%) lowers the blood pressure of those suffering from hypertension. This was demonstrated in a study conducted by Dr. Hans-Joachim Winterfeld, Berlin, with patients suffering from hypertension. Raised cholesterol levels can also be reduced by using the SANARIUM®. Even the concentration of serum in the tumor necrosis factor (TNF) decreased – by 11% – whilst the level of the anti-inflammatory cytokine interleukin-10 increased by around a third. 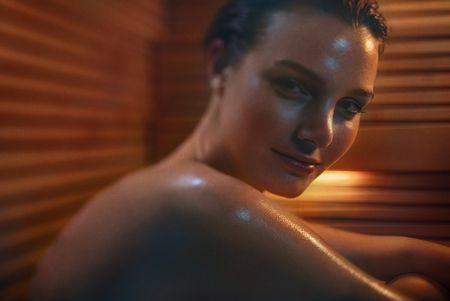 Hardly surprising, then, that the sauna can bring considerable relief to patients suffering from rheumatism if used during periods when they are free of inflammation. 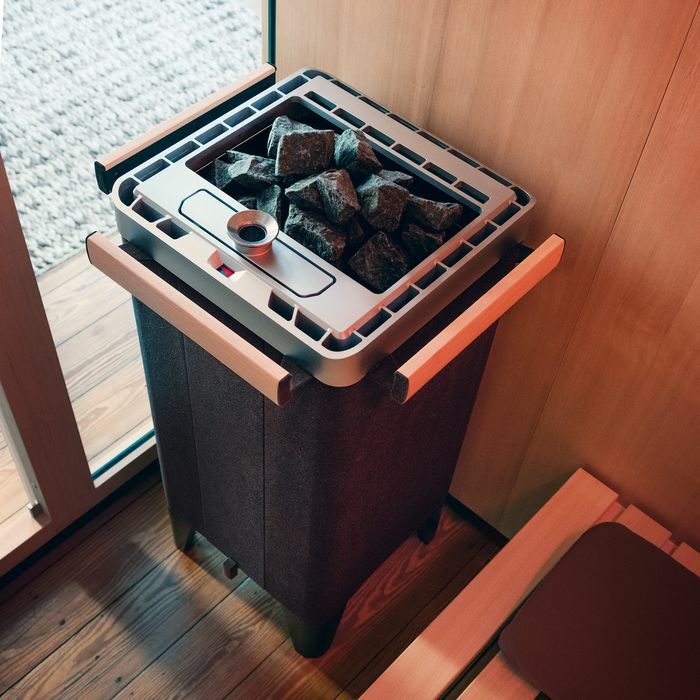 The MAJUS sauna heater for the SANARIUM®-features a turboheat function and bespoke design to make your sauna experience truly unique. 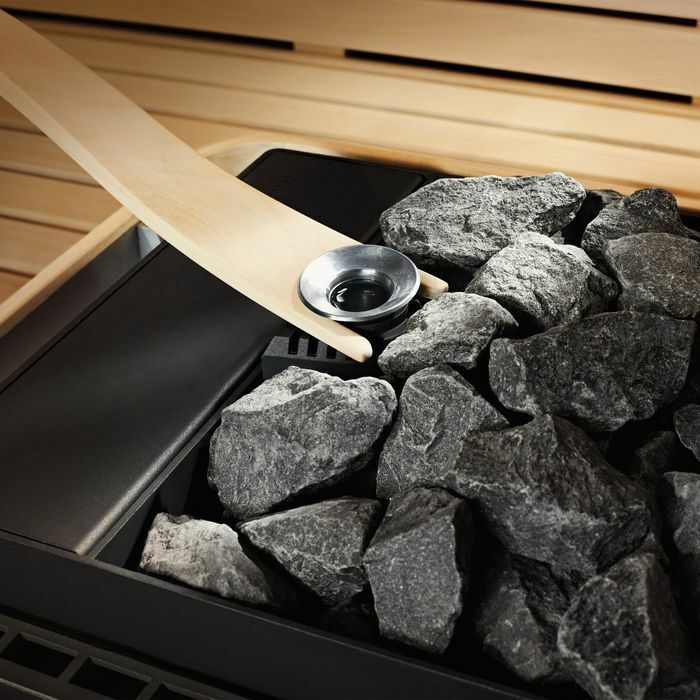 It has a detachable aroma bowl for filling the sauna with fragrances. Developed for the SANARIUM®, the special chamber enables you to add water to the vaporiser or drain off residual water with ease. The compact SANARIUM® oven FERO with integrated evaporator, water tank and level indicator is equipped with a removable aroma bowl for scenting. The FERO is characterized by quiet pleasant evaporator sounds and is available in two different sizes. 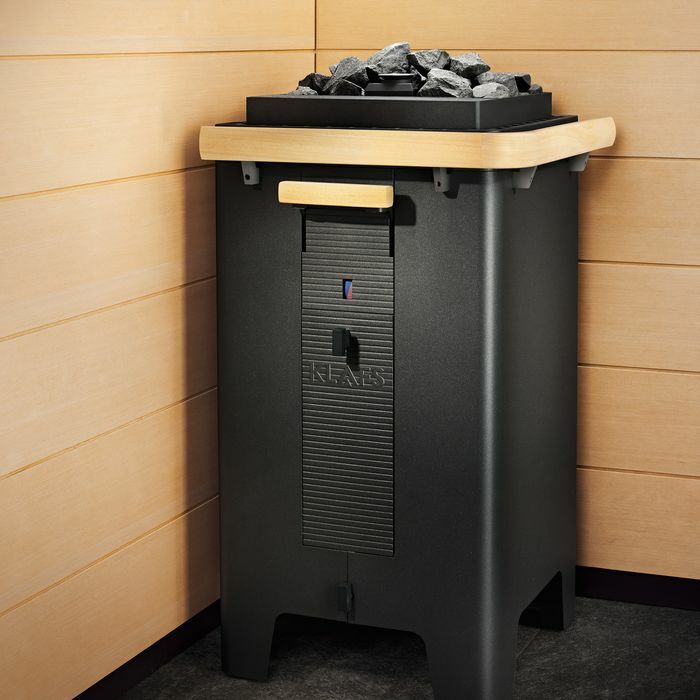 The BONATHERM underseat sauna heater has a detachable aroma bowl for filling the sauna with fragrances. Developed for the SANARIUM®, the special chamber enables you to add water to the vaporiser or drain off residual water with ease. The BONATHERM aqua panel has a large fill level indicator. A SANARIUM with SaunaPURE® introduces even more diversity to your spa settings – an aroma bowl scents the air inside the sauna, whilst the essential oils reveal their soothing character and have a positive effect on your respiratory tract. Another highlight is the loudspeaker integrated into the humidity sensor. This enables you to relax with meditative music, classical music or even stimulating sounds of nature as you enjoy your sauna. Ten pieces of music, produced exclusively for the SANARIUM® by the renowned music artist Shantiprem, have already been recorded onto the control panel. 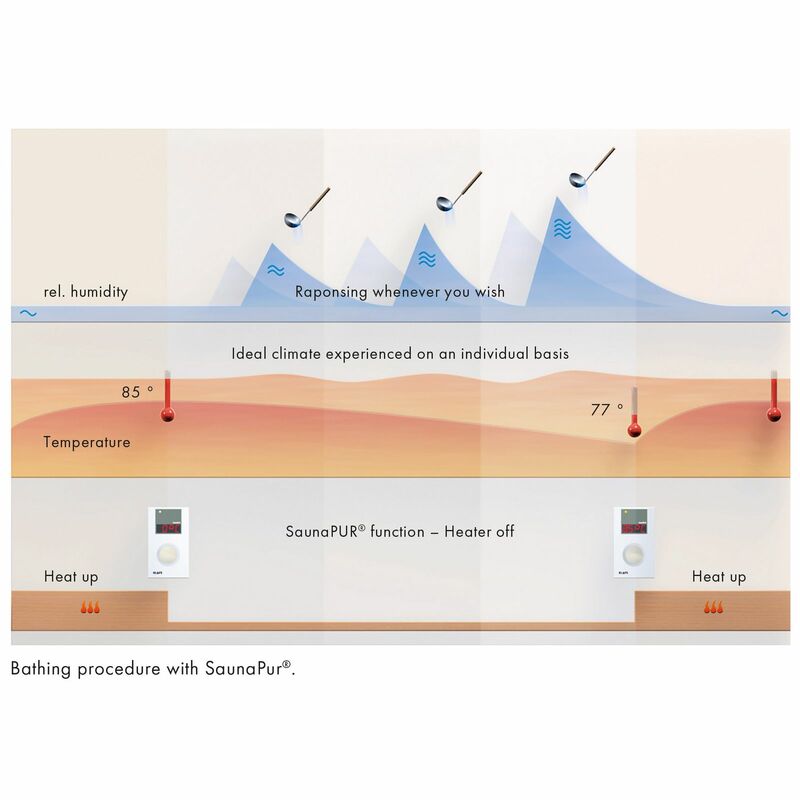 For all those who want to get back to the roots of sauna bathing, the SaunaPURE® function is the perfect choice. The sauna heater switches off as soon as the sauna has reached 80°-85°C. It then radiates gentle warmth, with the potential for lavish steam. “Löyly”, as the Finnish would say. We say – Thank KLAFS for the SaunaPURE® button! The SANARIUM®® by KLAFS turns one sauna into five. Sauna lovers can choose a different spa experience every day, just as the fancy takes them. 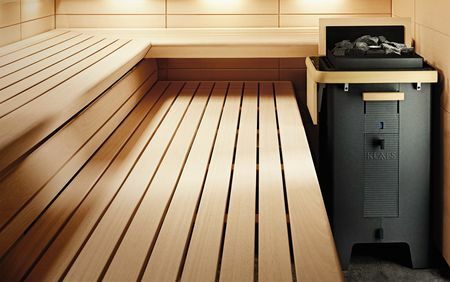 A classic Finnish sauna, for example or a tropical bath (bio sauna), where the hot, moisture-laden air will have you perspiring freely within minutes. The warm air bath is perfect for those who like warmth but aren’t comfortable if the sauna is too hot. The aromatherapy bath pampers your sense of smell, whilst choice essential oils help you relax. The soft steam bath is ideal for those who love steam baths. The SANARIUM® by KLAFS – always a good choice.